The hurricane ravaged the Sunshine state, leaving cities under water, and according to multiple media reports, 60 percent of homes across Florida were left without power. The storm also brought torrential rain to Georgia, South Carolina and Alabama. In the aftermath, Reuters reported the analytics firm Corelogic estimated damage from the hurricane at $42.5 billion to $65 billion. The members of Sheet Metal Workers Local 24 wanted to help those who lost so much due to Irma. 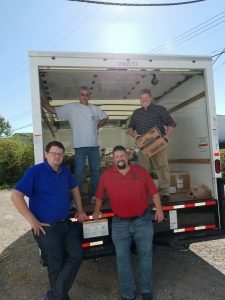 Clockwise from upper left: Business Rep. Jeff Rush, Training Coordinator Rob Gartner, Business Rep. Mike Tipton and Business Rep. Jeff Hunley load a truck with donations for Hurricane Irma relief. On Oct. 3, Business Representatives Jeff Rush, Mike Tipton and Jeff Hunley, plus Apprentice Coordinator Rob Gartner, loaded a truck with supplies donated by members and contractors for Hurricane Irma relief efforts. 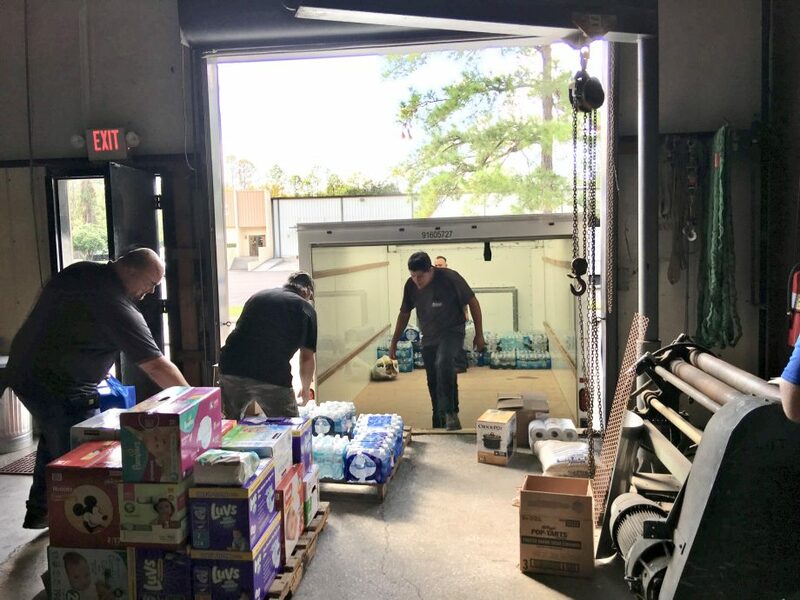 Rush then drove the truck full of supplies to Sheet Metal Workers Local 435, located in Jacksonville, Fla.
Local 435 Business Manager Lance Fout and his group of volunteers helped unload the supplies and assured Rush the supplies would get to the members in the area who needed them. We would like to thank the SMW Local 24 members, contractors and officers of Columbus, Dayton and South Point for all items donated for this relief event. Your efforts helped to make a difference in the lives of our fellow Brothers and Sisters who lost so much due to this devastating hurricane.